30 years and counting of la vita bella with Francaccio di Roma on WESU! Franco Liseo, whose DJ name is Francaccio di Roma, hosts Avanti Tutta, an Italian news and radio show. Franco has been on the air at WESU for 30 years and has fans all over the world! In our chat, we cover his Italian Catholic background and his life on both sides of the Atlantic. Clockwise from top left: Franco on the air; at the station’s monthly staff meeting’; with a placque commemorating his years of service; the cake he brought to the staff meeting; and posing with WESU General Manager Ben Michael. 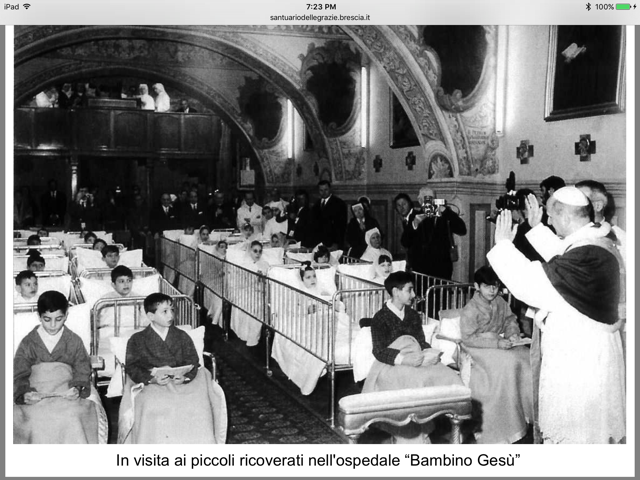 Below, Pope Paul VI confirms young Franco (praying in lower lefthand corner) at a hospital for children in Rome. Ad multos annos, Franco! Do you enjoy “Reasonably Catholic: Keeping the Faith”? A donation of any amount with a five in it will mark the program’s fifth birthday and help keep WESU going strong! Please give what you can at www.wesufm.org/pledge. Mille grazie! Even more bang for your donated buck: “Reasonably Catholic” will air every week during the Wesleyan summer break!